OCX Office Viewer Component for Excel is an ActiveX document container for hosting Excel documents in a custom form or Web page. The OCX Viewer for Excel is flexible, and gives developers new possibilities for using Microsoft Excel in a customized solution. OCX Office Viewer Component for Excel can be easily integrated into applications written in languages that support ActiveX control such as Visual C++, Visual Basic, Delphi, C++ Builder and .Net languages. OCX Viewer for Excel includes a library of sample code and the full C++ source code is also available. 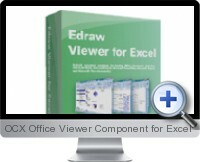 The OCX Office Viewer Component for Excel control is very customizable. The color scheme of any of the control elements can be changed, as well as determining the border type and a custom caption. These can be set at run time or design time as needed. Easily create online office applications with the OCX. Supports Microsoft Office Word, Excel, PowerPoint, Project and Visio. Supports office automating client to develop Office programs rapidly. Supports File upload and download with HTTP or FTP method. Can be easily integrated into applications written in languages that support ActiveX control such as Visual C++, Visual Basic, Delphi, C++ Builder and .Net languages.